Although January is quickly coming to a close, we want to highlight the fact that this is Thyroid Awareness Month. According to the American Thyroid Association, about 20 million Americans have some type of thyroid disease and over 12% of people in the US will develop some kind of thyroid condition in their life. Having an undiagnosed thyroid condition can also put you at risk for other issues, including osteoporosis, infertility, and even cardiovascular disease. There are some excellent resources available to read up on thyroid health, so you can have an informed conversation with your healthcare provider about whether you need to be concerned about thyroid issues. Read on to learn more. 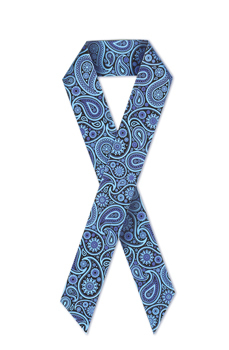 The paisley ribbon signifies thyroid awareness. What is the thyroid and why is it so important to our overall health? The thyroid is a small, butterfly-shaped glad in the back of your neck right below the Adam’s apple and above your collarbone. The thyroid gland makes hormones that control all sorts of things in your body, including your body temperature, heart rate, metabolism, and more. Needless to say, when your thyroid gland is not working properly, it can lead to adverse effects in your body. Here are some great resources to learn about this small but mighty gland. The American Thyroid Association is the leading organization in the U.S. devoted to all things related to thyroid health. Here you can find out more information about thyroid disease, read the latest thyroid health news, and find brochures and FAQ. You can also learn about clinical trials, locate a thyroid specialist, and find patient support information. Read about the 6 common thyroid disorders and problems, their symptoms, diagnosis, and treatments. The site also has a page on thyroid gland basics, where you can see a 3D model of the gland, and learn more about how it works in the body to produce hormones. If you read our blog, you know MedlinePlus is our go-to resource for all patient health information. This site lays out everything you need to know about the thyroid gland, thyroid disease, and all of the various tests associates with the many thyroid conditions, all in easy-to-read language. You can also read about prevention and risk factors, and watch a video on how the thyroid gland is surgically removed. Get basic information about all of the different thyroid conditions, including goiter, thyroiditis, hyperthyroidism, hypothyroidism, Graves disease, and more. You can also see a detailed picture of the thyroid gland to better understand how it works in the body. Read about all of the tests associated with thyroid conditions, and the many treatments for thyroid diseases. Did you know that women are more likely than men to have thyroid problems, and that one in eight women will develop a thyroid condition in her lifetime? This site gets specific about how thyroid conditions effect women, including issues with menstruation, fertility, pregnancy, and menopause.